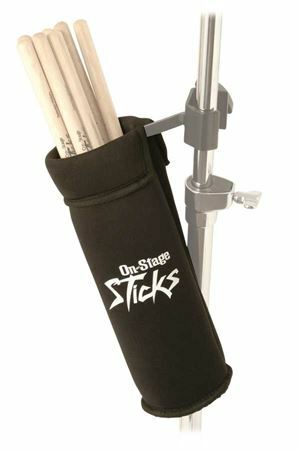 Shop On Stage DA100 Drum Stick Holder from AMS and enjoy Fast & Free Shipping. The c-shape mounting clamp attaches easily to most stands and other hardware, and the extension arm is angled downward at 45° for easy removal/placement of your sticks while playing. The cup holder can be removed from the hardware for cleaning purposes. This is a great bag that I can angle for quick retrieval on my hihat stand. Lightweight but sturdy construction. No regrets on this buy. Best stick holder for the price! Dropping sticks always comes at the worse time, but this stick bag is perfect for holding extras and can be placed in any convenient spot. Plain and simple but totally practical. I have always used a stick bag that hangs on my floor tom but it has always been bulky, noisy and limits access. This holder is compact and is easy to put in a more accessible location. Will be ordering another so I can have one on each side of my kit. I didn't realize the grip was small and can only be attached to standard hardware. I have an electronic drum set hanging from a rack with thick columns. Can hang the bag! Great, holds all my sticks and fits in easy. Perfect no-brainer purchase and well worth the money!! Great in many respects, however, the label says in contains cancer causing agents. Otherwise, it is exactly what I needed. Yes - well made and dependable - only drawback is the material it is made of.